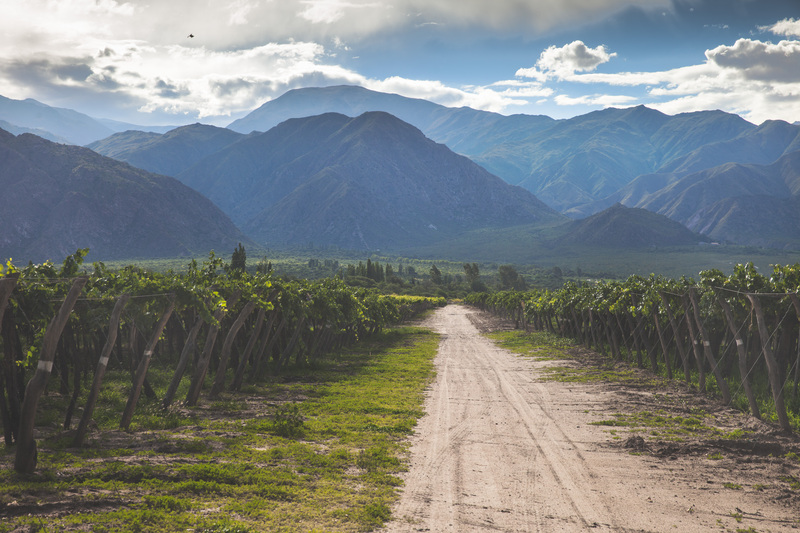 El Porvenir is a gorgeous family-run winery situated in Cafayate in the arid province of Salta in northern Argentina. The unique conditions here are perfect for their wickedly fragrant Laborum Torrontés (Argentina’s flagship white variety) and they’ve also received abundant praise for reds like their Laborum Single Vineyard Tannat 2015 which was named one of Argentina’s top 100 wines by Tim Aktin. What makes these Cafayate wines so special is a combination of hot, dry desert conditions and high altitude; the region currently boasts the highest vineyard in the world, Bodega Colomé’s Altura Maxima Estate, which sits a lofty 3111 metres (10,200 feet) above sea level! El Porvenir’s four vineyards have a pretty respectable average altitude of 1750 metres (5740 feet). For purposes of comparison, Europe’s highest vineyard (probably!) sits at 1150 metres above sea level in the town of Visperterminen in Switzerland. Cafayate is actually located at a latitude of 26°, a little further north than the typical 30-50° latitude range where most vineyards are located. Fortunately, the influence of altitude makes winemaking possible here as it reduces temperatures by as much as 1° Celsius every 100 metres, and it also creates a significant diurnal temperature range of up to 20° Celsius. The increased intensity of sunlight and extra UV radiation from the altitude helps grapes to achieve fantastic ripeness which gives delicious jammy fruit flavours and smooth tannins in red wines, while the cool nights allow them hang on to a decent level of acidity. The temperature changes also encourage the grapes to develop thick skins which increases concentration, creating really intense, powerful wines. Spectacular Cafayate vineyard. Image source: Chris Ford via flickr. Meaning “the future” or “what is to come” in Spanish, El Porvenir combines a deep connection with the past of these ancient lands with international expertise and current technology. The Romero-Marcuzzi family originally purchased a traditional winery which they modernised and converted into top quality winemaking facilities. Rather than destroying the old building, they decided to preserve the original adobe walls of the structure and built a new building inside. Family is also central to their vision; the current director of the winery, Lucía Romero-Marcuzzi, actually took her first steps as a baby in the family’s vineyard. Under her oversight, El Porvenir focuses on limited production, premium wines, and the winery benefits from the assistance of “flying winemaker” Paul Hobbs who acts as a consultant. The El Porvenir wine that I can’t stop drinking at the moment is from a line of four blends. The line is called Amauta which is actually a word from Quechua, the old language of the Incas, and it’s still spoken in northern Argentina. Chosen to honour the heritage of Cafayate where this wine is made, “Amauta” means wise man or great teacher in Quechua. For the indigenous peoples, this teacher possessed knowledge of the universe, nature and humanity’s place in it. One of his teachings was the idea of a divine duality in the world; two elements that would combine harmoniously like day and night, life and death, or in this case Malbec and Cabernet Sauvignon (topped off with a cheeky dash of Syrah). This particular blend is called Inspiración and it’s a rather inspired mixture of 60% Malbec, 30% Cabernet Sauvignon and 10% Syrah. Now, making a blend (or at least making a good one!) isn’t easy. It’s an art form. The basic principle is to combine the best characteristics of all the grape varieties you are using and achieve something unique and special. A wine that is far more than its constituent parts. Here El Porvenir has selected two red varietals that have enabled the Argentine wine industry to flourish – Malbec, of course, and also Cabernet Sauvignon which today constitutes over 15% of plantings of red wine varieties in Argentina. This blend works in similar fashion to a red Bordeaux; the Cabernet Sauvignon provides firm tannins (the drying sensation you might notice at the front of your mouth over your teeth) which gives body and structure, while the Malbec softens and makes the wine easier to drink. Cabernet from Salta tends to be the boldest and most interesting examples of the variety produced in Argentina; with Inspiración it lends raspberry and strawberry flavours with a distinctive peppery finish which is enhanced by the dash of Syrah. Cafayate Malbec tends to be spicy with beautiful jammy dark fruit like blackberries and plum topped off with a light fragrance of violets. In the mouth the two combine bewitchingly in a boisterous yet sensuous and delightfully smooth experience that culminates in a long and fiery finish (no innuendo intended, I promise). I could quite easily drink this all day. Inspiracion could be kept for up to 10 years, but when it tastes this great, why would you wait that long? As a sprightly youngster, this is a wine which works really nicely with a classic Argentine beef steak cooked on the barbeque. The pairing works because the strong smoky flavours of the meat are matched by the vigorous, spicy wine, while the fat in the meat helps to round out tannins and soften the wine. Classic Argentine empanadas. Image source: stu_spivack via Wikimedia Commons. Another even more regional food pairing is the Salteña empanada. This traditional savoury pastry is made all over Argentina, but some of the most interesting examples share the birthplace of this wine – the northern province of Salta. In Spanish the name means to wrap or coat in bread, and this is the kind of food that gauchos (the Argentine cowboy) would take with them as a packed lunch. Salteña empanadas are typically stuffed with beef, potato, onion, a chopped boiled egg and some cumin spice which harmonises beautifully with the spicy notes in the wine. If you fancy trying it out yourself, these beef empanadas also work great with bold Argentine Malbecs. You can find a great traditional recipe courtesy of the Latin Kitchen here. Have you tried any great high altitude wines? What did you love about them? What a powerful description of the way-up-there setting for this vineyard. So interesting. It has to be a very unique taste profile. The wine sounds gorgeous. The sort of third-glass bottle I can’t resist. Thanks for sharing! No problem! Hope you get to try it some day. Very unusual, interesting single varietal Malbecs from Cafayate as well, worth looking out for. Nice post. I’m a big Paul Hobbs fan. Thanks! Glad you enjoyed it. Have you tried any El Porvenir wines? Yes. I know Paul Hobbs from my California days. I also like Pulenta Estate and one of his first projects Vina Cobos in Chile. His California Estate wines are terrific.